married mum to four (aged from almost 30 to 5 years of age)makes cupcakes ,gardens ,visits National Trust properties for pleasure & knows a bit about astronomy ! 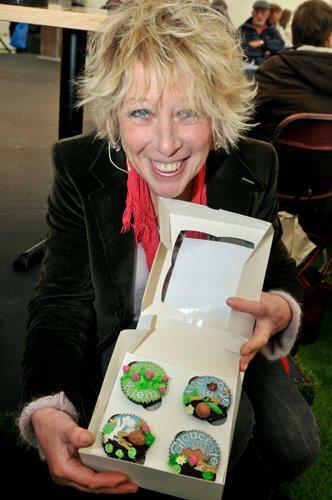 This entry was posted in cupcakes, my garden, Uncategorized and tagged Carol Klein, Carol Klein at Gloucester Quays Garden Party April 2012, Gloucester Quays Garden Party. Bookmark the permalink. Thanks for the ‘like .’I’m new to all this,just playing around really .Hope to learn how to make it all look a bit more professional!Lovely to meet another cake enthusiast !I’ve not really attempted piping writing ..yours looks great !